Ready to give back to the soil that sustains you? We offer weekly pick-up of kitchen scraps to your residence or business in Victoria, BC. 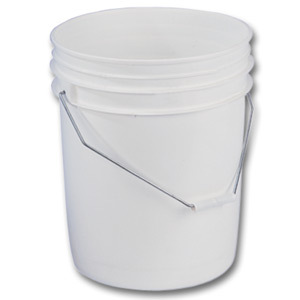 We provide sturdy, air and water tight 5 gallon pails for your scraps, and flexible pickup schedules. Most residences fill up one of these every other week. Our business clients tend to fill one or more buckets every week. If you live in a residence, depending on where you live, you will have your pickup either Monday, Tuesday, Wednesday, or Thursday. Our downtown business clients are serviced on Fridays. When you email us, just let us know your location and we’ll let you know exactly what zone you are in. Below is our wall/fridge poster which you may wish to print out to keep above your bucket to remind you if what we do and what can go into the buckets. Please note that we do not accept plastics of any sort, including “compostable” plastics which are often toxic to the finished soil and actually harder to remove from the finished product then traditional plastics. 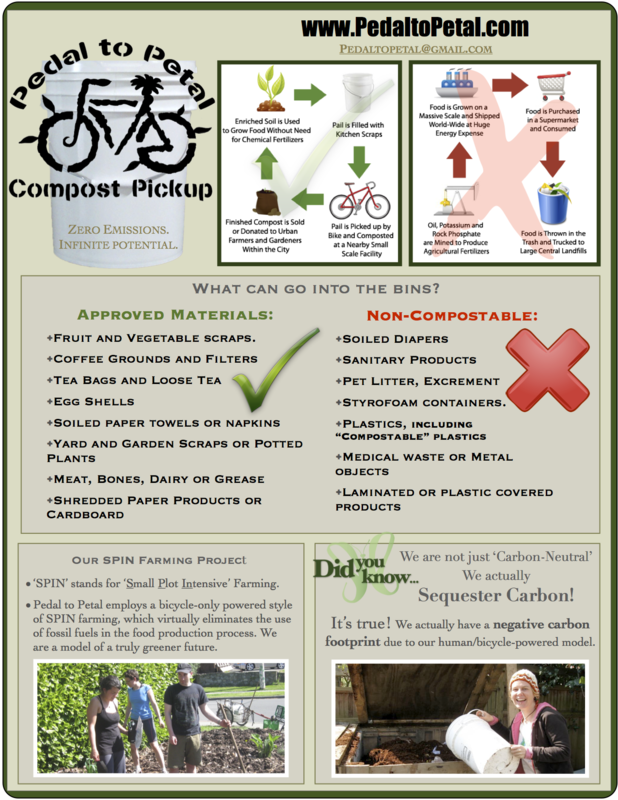 Contact us at pedaltopetal@gmail.com to start your Victoria BC compost program! Please don’t hesitate to learn more about Our Mission. * $7.99 per pickup is our ‘suggested’ standardized price. We have always operated on a sliding scale, on a pay-what-you-can model. In the past the average contribution that individuals elected to give us tended to be around $7.99, which kept us afloat essentially on the goodwill of our extremely valued and generous customer base. Our economic situation and our market has since changed, and we have chosen this price carefully as a number which seems to work for everyone. This price standardization allows us remain competitive, pay our cyclists a fair wage, invest in our projects and initiatives, and cover logistical and administrative costs so that we can continue our mission. If you are excited about composting with us but on a limited budget we are willing to accept as little as $5 dollars per pickup, please talk to us, we are friendly! We are very interested in a compost pick-up, but uncertain as to how much compost we actually will create on a weekly basis, but for obvious reasons, would need a weekly pick-up. Any suggestions or is there a specific/minimum volume that is picked up? I am wondering what you compost your organics in. What kind of Composters. I would like to introduce you to http://www.joracanada.ca. Hi there , Thank you so much for the gerat inspiration, and your lead and voices toward a greener planet. To me, following the Spin Farming model, I won’t charge for getting a bucket of their food scraps, it would be like borrowing lands, I will give them back actually two buckets of compost made with their golden waste and use the surplus for my own farm. I wonder if anyone has tried it before. Please feel free to call me, email me, thanks a bunch friends! For only $7.99* per bucket, we'll haul your kitchen scraps away by bike and turn them into rich, organic compost. Explore our unique vision of the future of Agriculture.